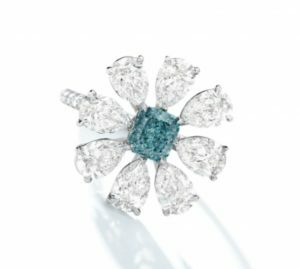 We were looking forward to the results of the auction, but were quite disappointed when some very important Fancy Color Diamonds went unsold. What happened? We should first review what did sell, and some of the surprises, and then we can look at what did not sell. 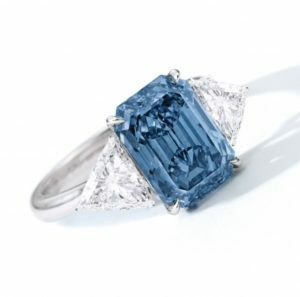 The 5.20 carat, Fancy Grey-Blue diamond sold for a surprising amount of $1,277,513 or $245,675 per carat. It was estimated to sell between $230k to $357k. The color was sweet and soothing. the blue color was very much predominant here. 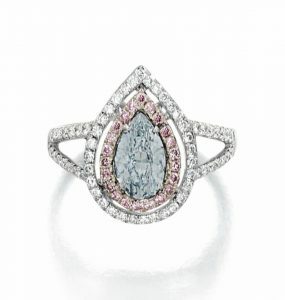 The 5.20 carat, Fancy Grey-Blue diamond at bottom. 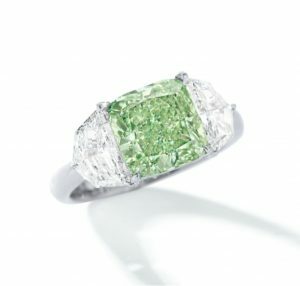 The 3.05 carat, Fancy Intense Green Diamond with SI2 clarity, was sold for $757,069 or $248,219 per carat, a pretty decent price which fell inside the estimate of $625k to $829k given by Sotheby’s. 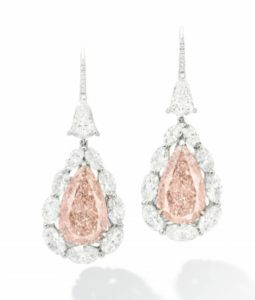 The pair of Fancy Pink-Brown diamond earrings with 6.98 carat and 6.66 carat, with SI1 and Internally Flawless clarities got sold at $695,840 or $51k per carat on average. They were estimated to sell between $587k to $765k total, also within the range of the estimation. Should the color been Fancy Brown-Pink, it would have sold for a higher price, as the price depends the predominant color. In this case it is Brown. 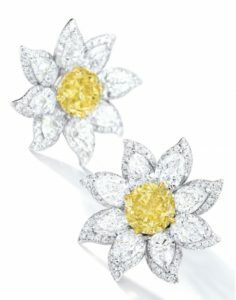 The pair of earrings with the two; 2.15 and 2.08 carat round Fancy Vivid Yellow were sold for $191,340, or $45.2k per carat on average. They were assessed to sell between $128k to $166k. They were basically sold for the top value plus the buyer’s premium. 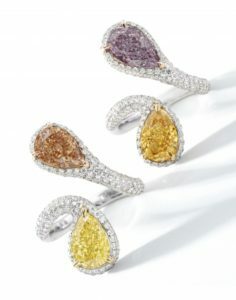 Round brilliant Fancy Color Diamonds command a higher price than other shapes. 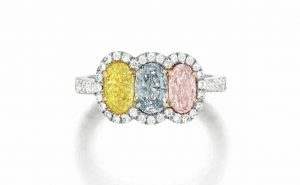 The multi color ring with yellow, blue and pink diamonds was assessed at between $33.1k to $43.4k and ended up selling for $57.4k total. 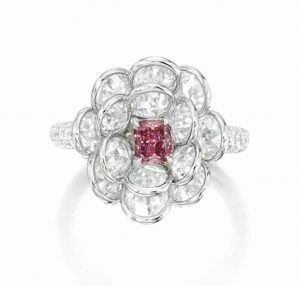 The 0.36 carat Fancy Deep Pink with I1 clarity, diamond ring was sold for $44,646 after being assessed for $35.7k to $46k total; within the range. 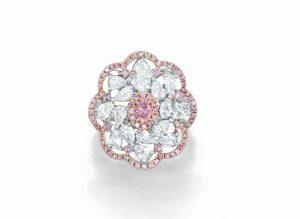 The 0.23 carat, Fancy Intense Pink with SI1 clarity diamond ring was sold for $44,646 after an assessment between $25.5k to $35.7k total. The 0.72 carat, Fancy Light Grey-Blue with VVS2 clarity diamond ring was sold for $30,296 after an assessment of $19.1k to $25.5k total. Surprisingly enough some important Fancy Color Diamonds went unsold. 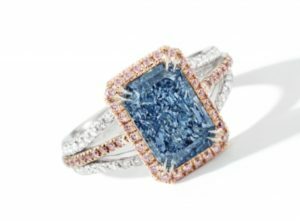 The 3.32 carat, Fancy Vivid Blue Diamond with Internally Flawless clarity went unsold. The minimum of the assessment was $5,867,760 or $1.767 million per carat. 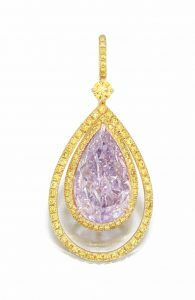 This is quite surprising as the value for such a color, size and clarity is well above the $2 million per carat. The minimum bid would have made a great investment over a medium term of 2-4 years. Normally I recommend to hold for at least 5 years, but in this case, buying below market value allows us to consider a shorter term. The color was strong, and there was no traces of any kind of grey color. The 2.56 carat, Fancy Vivid Blue diamond with I1 clarity also went unsold. The low end of the value was $2,678,760 or $1.046 million per carat. Although the clarity was a low I1 clarity, it is difficult to see this low clarity in such a color. This too, would have a been a great opportunity over the medium term. The 1.21 carat, Fancy Vivid Green-Blue diamond with SI1 clarity did not sell either. The low estimate was $790,872 or $653.6k per carat. Another opportunity that has the possibility to bring in a nice value for investors over the next few short years. The 1.16 carat, Fancy Vivid Purplish Pink with I2 clarity went back home. The minimum bid for sale was $242,364 or $208,934 per carat. The 5.01 carat, Fancy Pink-Purple with I2 clarity went unsold. The minimum bid of $306,144 or $61k per carat was not reached. 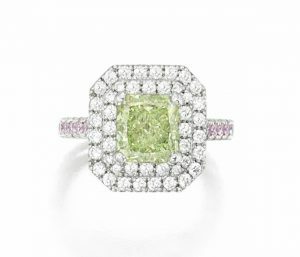 The 3.31 carat, Fancy Yellowish Green with VS2 clarity did not reach the $114,804 or $34,683 per carat. 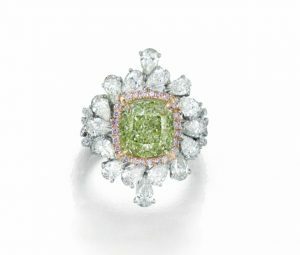 The 2.07 carat, Fancy Yellow-Green with SI1 clarity, did not reach the $40,819 or $19,719 per carat. We can reach several conclusions here. The first being that every industry, no matter what has its better days and less good days. We have to take advantage of those slower times, and if a diamond is a top color, clarity and the overall make is excellent, to not be afraid and invest, because soon enough, the new wave will arrive and we can potentially enjoy an excellent return on investment when appetite of buyers comes back. We can also conclude that even less expensive items may end up not selling. 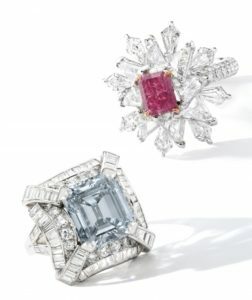 This is important to those that are looking to sell their jewelry because in the majority of the time, the auction option may not be the best way to go.